I am excited today to be the last guest in the lovely sewing series called - Roots: Sewing your heritage, hosted by the lovely Heidi of Elegance and Elephants. Heidi has invited bloggers from around the world to create something inspired by their cultural/family heritage. You can read the introductory post here. I am the Aussie counterpart! 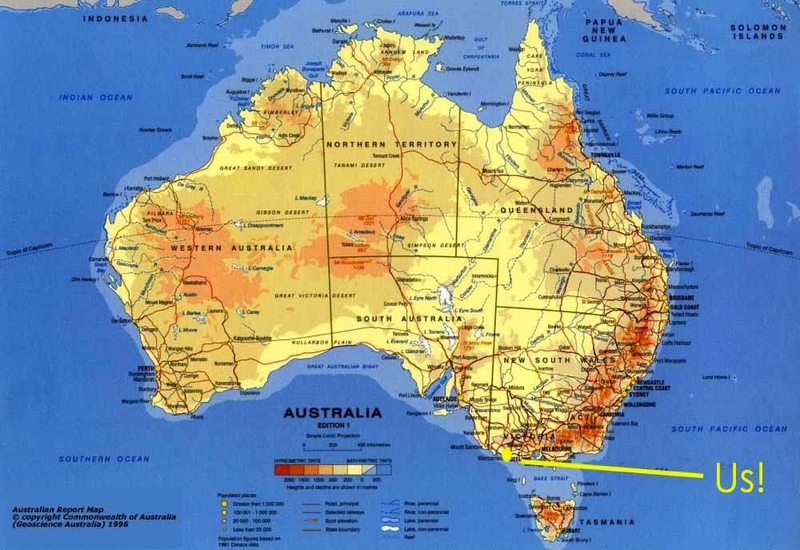 Here is my wonderful and lucky country, Australia!!! I am Australian, born and bred. The previous three generations of my family tree (parents, grandparents and great grandparents ) were all also born in Australia. So, a very 'Aussie' look was what I was after. I did toy with trying to create something inspired by Australia's convict history, I could also create something inspired by Australia's Aboriginal culture. But since I do not have any direct family ties to Aboriginal culture so for me, sewing my roots came down to sewing something inspired by my childhood and the landscape of Australia. With this in mind, I decided to create something based on the Australian coastline. Australia is a one huge, amazing island. The majority of the population are scattered around the coastline. Australia has some amazing beaches. I have visited much of the coastline throughout my life - both as a teenager and also an adult. We boast the Great Barrier Reef, Broome, Byron Bay, Ningaloo Reef, The twelve apostles, Wilson's Promontary and countless other famous Australian landmarks that are located along the vast coastline. You can read another great Roots story inspired by the rugged coast at Renee's blog (her history is also more informative than mine!!). I grew up in the coastal town of Warrnambool, situated three and half hours south west of Victoria's capital, Melbourne. I have lived in Melbourne since I was eighteen years of age, but four weeks ago, we moved back to Warrambool! I have moved back to the place of my roots and we are now creating a life where our children can establish their roots. An exciting time. Warrnambool has a lovely beach and also many rivers. Isabella is mad about the beach. She steps into another world once her feet hit the sand and she happily plays in the sand, waves and shallow waters with the biggest smile on her face! 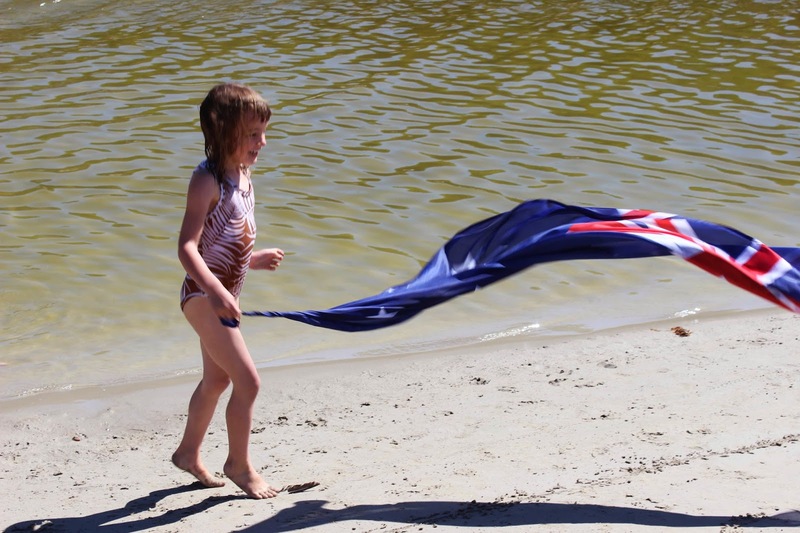 These photos were taken, of all days, on Australia day on Sunday! Down at the river mouth ten minutes from our house. So, it's finally time to tell you about what I made. I purchased a cotton lycra brown vine print a few months ago. I have a photo of myself at the same age in very similar print bikini so it fit on two levels to make bathers for this series. I loosely based the bathers on the pattern in Summer 2009 edition of Ottobre. I adapted the straps making them wide and joining together at the back. I also wanted to make Issie a beach shirt. 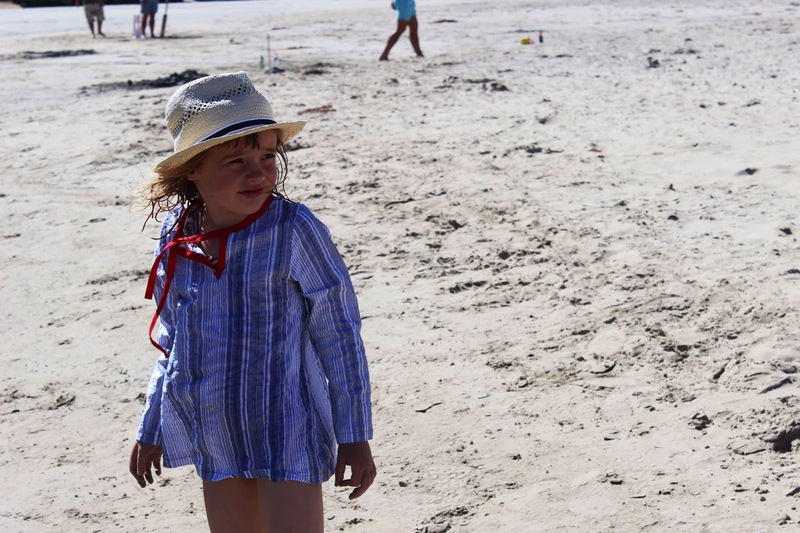 I love letting her play on the beach, but with the hot Australian sun, a shirt is a necessity. I was inspired by the colours of the Australian flag to make the shirt. I picked up a blue and white striped cotton seersucker and drafted a simple loose fitting shirt. I used red biased binding around the neckline. 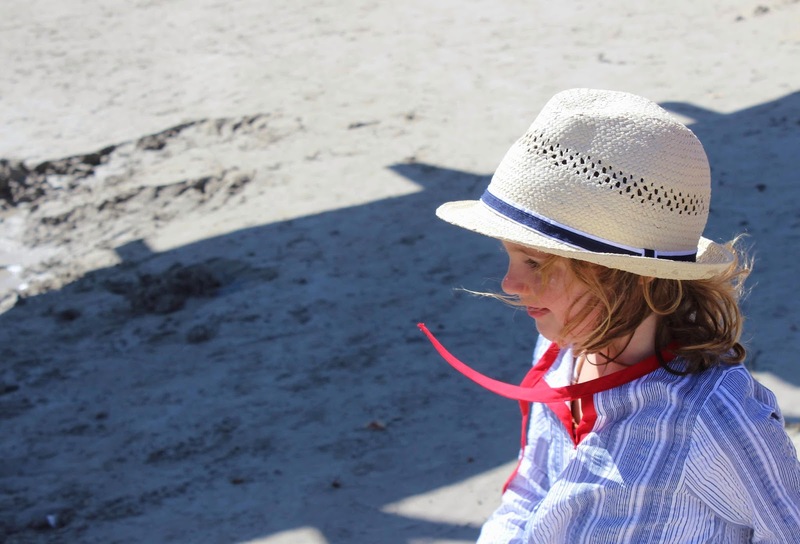 Isabella loves her little straw hat I bought her for Christmas and it suited the theme! She didn't look so out of place dancing around with the Australian flag on January 26th! I feel very lucky to live in such a lucky country - Australia. I can't imagine living anywhere else and am so glad to be raising our girls in such a fortunate and beautiful place. I hope you have enjoyed my post. 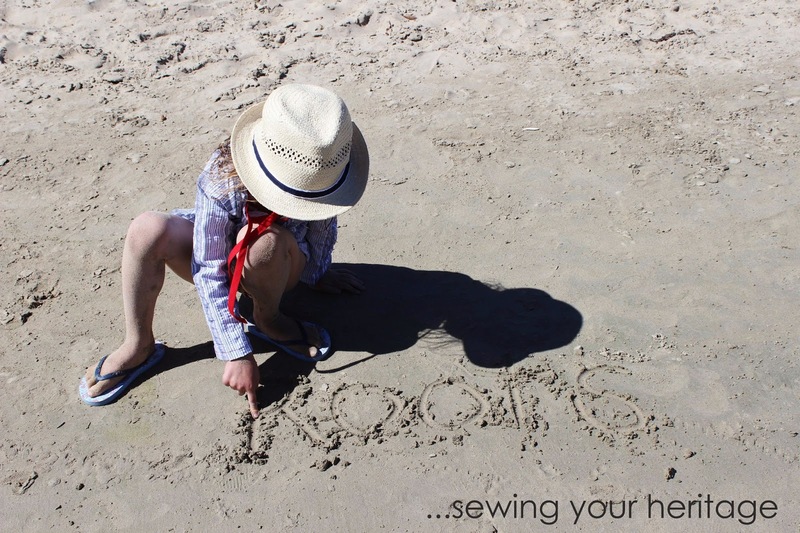 Thanks so much for having me Heidi - it has been lovely and we are sure to get lots of wear this summer from our Roots inspired sewing!! You catch up and read all the past posts in this series over at Elegance and Elephants. 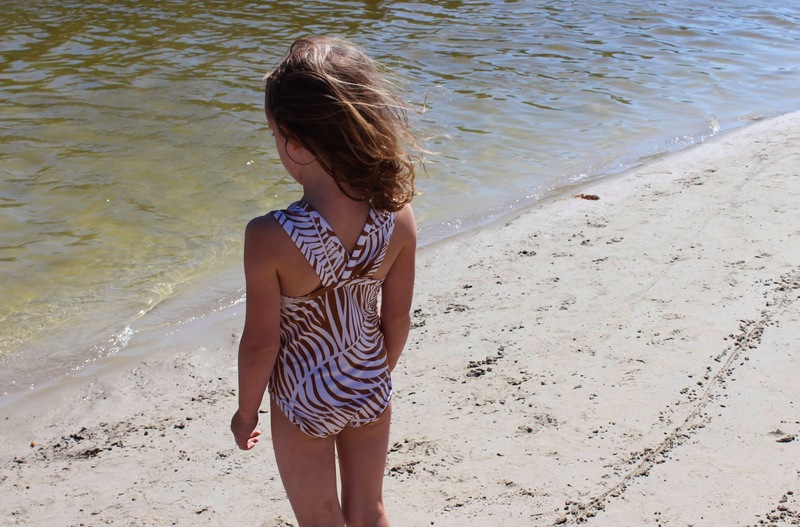 Love the bathers and the shirt looks perfect for playing at the beach! Seeing your post makes me want to visit Australia more than ever, Suz! What a perfect outfit to represent what Australia means to you. And thank you so much for participating (especially since you just moved…that's ambitious)!! Dang, that looks nice!!! And I LOVE the bathing suit....and the happy look on your girl's face...well, at least one of them, ha. That bathing suit is gorgeous, Suz!!! Oh, I miss summer!! Living in Florida I just loved your post. And what a clever interpretation of your heritage. 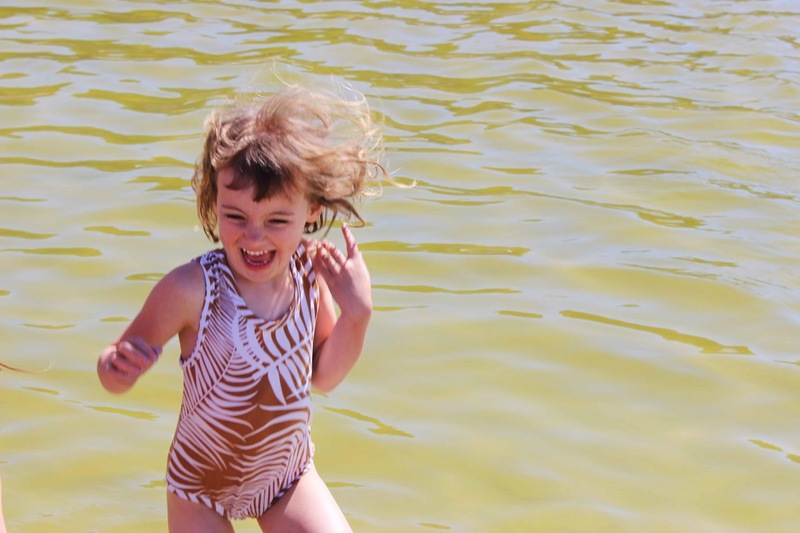 Oh my gosh… the bathing suits are AWESOME!!! 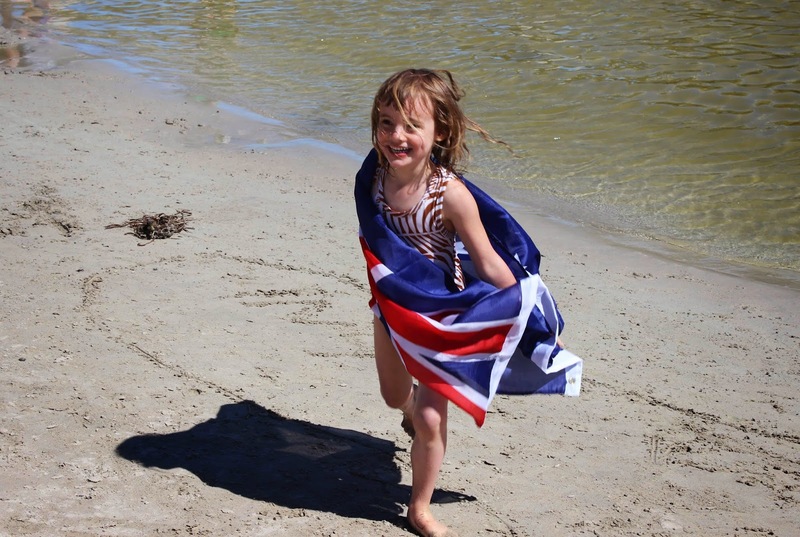 Looks like your family enjoyed a wonderful Australia day at the beach. I am dreaming of summer right now during our very cold and snowy winter. Oh! I am so jealous! I'd love to be there! 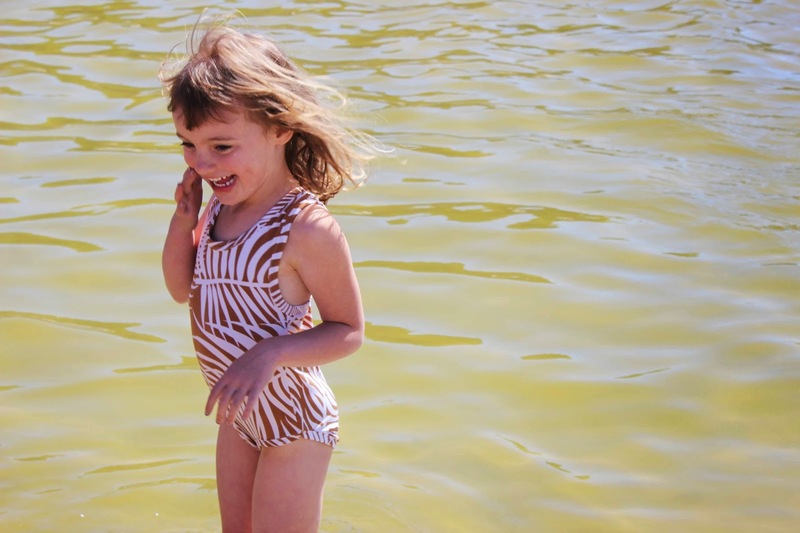 The bathing suits and your little ones are so cute! Oh to be in that warm sun! I really like the vine print you used for the bathing suit, and the shirt is icing on the cake. Great job Suz! Thanks everyone I am sure I am making a few people jealous with our sunny days over here! What a wonderful timing for the series - just when you returned to your hometown :) Bathers is a wonderful choice for the series, and it looks wonderful on Isabella :) She has such a gorgeous smile! I LOVE the bathing suit. The shirt is perfect for the beach. Really enjoyed reading your post. Sounds like such a great place to live. Those bathers are fantastic - I love the style and the fabric. And the beach shirt is a great idea for keeping safe in the sun. Ooohh, I'm so envy of you for the SUMMER! and the beach... great job, Suz! Love both of bathing suits and a shirt! Lovely! It's so good to see pictures of sunshine! We need them over here. And I'm impressed that you've managed to make these - and move house! Am finally back online after moving too! Love the whole outfit including the hat. Never knew Warnie had such a great beach! That's a cool sewing theme. I really like the vine print you used for the bathing suit.